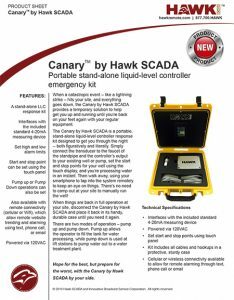 When a catastropic event – like a lightning strike – hits your site, and everything goes down, the Canary by Hawk SCADA provides a temporary solution to help get you up and running until you’re back on your feet again with your regular equipment. The Canary by Hawk SCADA is a portable, stand-alone liquid-level controller response kit designed to get you through the night — both figuratively and literally. Simply connect the transducer to the faucet of the standpipe and the controller’s output to your existing well or pump, set the start and stop points for your well using the touch display, and you’re processing water in an instant. Then walk away, using your smartphone to tap into the system remotely to keep an eye on things. There’s no need to camp out at your site to manually run the well! When things are back in full operation at your site, disconnect the Canary by Hawk SCADA and place it back in its handy, durable case until you need it again. There are two modes of operation – pump up and pump down. Pump up allows the operator to fill the tank for water processing, while pump down is used at lift stations to pump water out to a water treatment plant. Hope for the best, but prepare for the worst, with the Canary by Hawk SCADA by your side. Click the image at left to download The Canary product sheet.